Update on 11.1.2.2 – What you need to know! This is very surprising, but I doubt it will have much impact. I can’t imagine many clients will do this as they would have to pay for a WebSphere licenses when they can get a free-use license of WebLogic and that keeps everything in Oracle’s supportability back yard. Smartview will contain the latest patch that levels the playing field between smartview and the excel add in. In addition, it will connect to Strategic Finance. We are really seeing Smartview being the desktop delivery strategy for EPM. Smartivew will also connect directly to products instead of being routed through the smartview provider. As such there are a few new WEB containers introduced in HSF, HFM, and Financial Close Management. We can share the relational DB with other Fusion Apps and they also removed the requirement for setting Database’s NLS Length Semantics, which made a shared databases incompatible in some cases. 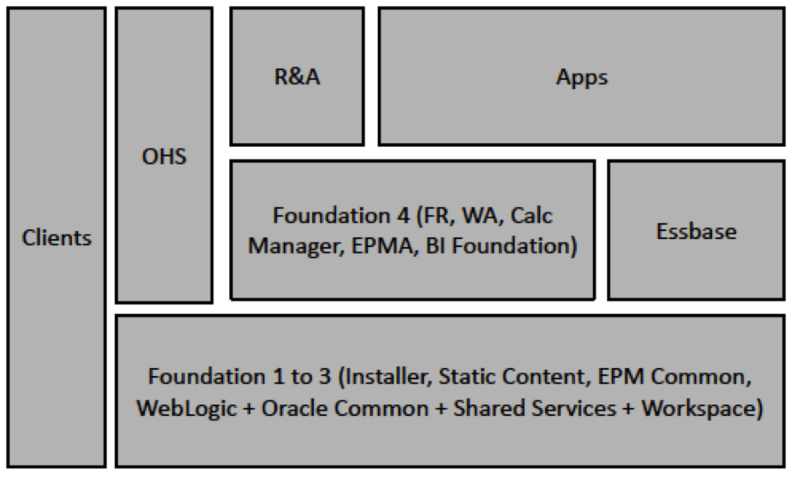 No surprise here, Oracle is getting the EPM products consistent with the rest of the Fusion apps by recoding them using Application Development Framework (ADF). This will ensure EPM and the rest of the Fusion apps have a consistent look and feel and functionality to them. Oracle will be releasing a compact deployment option. This will be a simple installation that is intended to be put on ONE server for a small DEV or Proof Of Concept instance. In essence, it combines all the 15 separate java Web Apps into one java.exe container. This is great to get up and running while you are provisioning your permanent servers to get projects started, however it should not be used for anything more than a temporary instance and not intended for anything permanent of production. The nice thing is that the compact deployment instance wont need a lot of memory and will start up in about 5 minutes (as opposed to 20 minutes+) since it only has to start one java container. You can even bypass the need to install the big-overhead Oracle HTTP Server (OHS) and use the embedded Weblogic HTTP server. A very welcome addition indeed. Since the desktop clients such as the FR studio, Essbase Studio, Smartview, and HFM/FDM clients all require users to have administrative access, deploying them in some organizations has traditionally been difficult for tight security shops. IT had to create packages (MSI’s) that would deploy to users automatically through some push out sentinel program. Oracle has been nice enough to give us these MSI’s – saving IT a lot of time. My only question on this so far is if it detects a previous version and uninstalls/upgrades. We will see. HBR has always been nestled within Essbase Administration Services. Oracle is standardizing on Calc Manager from now on and will provide a nifty tool to automatically convert them for you. No surprise here either. Fusion applications are packaged with OEM. 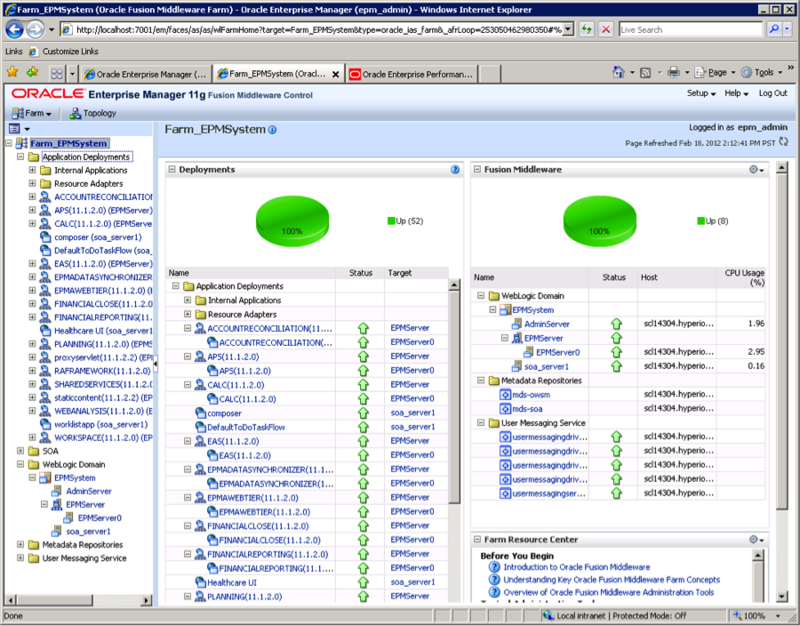 OEM has traditionally been used to control and administer the Oracle Database. We now see more proof that Oracle is expanding the use of OEM to be the one-stop place to administer Fusion applications. OEM will Monitor servers and services and analyze performance. This may put a damper on some of the third party tools being sold today to do this in a nice little interface. What I like best about this, is it should give people the ability to start/stop/monitor EPM services without IT involvement or having to give access to the servers themselves. HFM configuration has moved to the EPM system registry instead of the Windows system registry. This was needed to be consistent with the rest of the suite. This will allow us to configure HFM clusters on one machine without having to do it on all nodes. Oracle has improved the software download and assemblies on edelivery by packaging them together by functionality and combining smaller files, reducing the download from 11.4 GB to 7.8. Significant enhancements and simplification in Life Cycle Management (LCM), reducing the number of clicks. LCM now creates artifacts on import. Finally – we can change the ADMIN user ID! We are not stuck with “admin” as the administrator for this system anymore. Good stuff as the admin ID sometimes conflicts with other admin IDs in external corporate directories. Furthermore, we can now disable the native “admin” user altogether and use an external corporate directory authenticated user as the administrator. We will have 11.1.2.2 up in our LAB soon and will know more. We will also be showcasing 11.1.2.2 on some upcomming webinars and during this year’s Collaborate Confernece in Vegas. We are offering a discount to register for Collaborate as well. ~ by Eric Helmer on March 16, 2012.